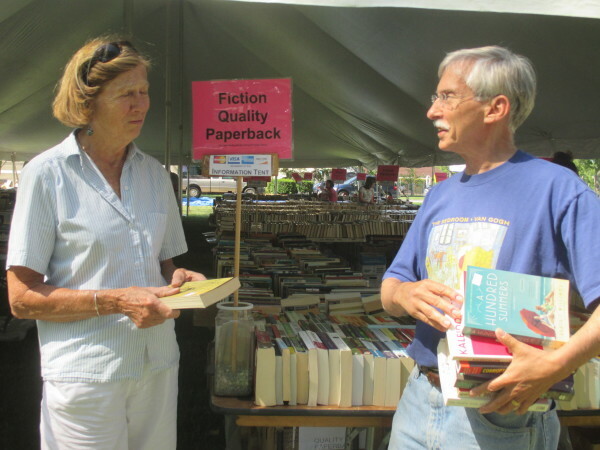 FALMOUTH – Nothing says summer on Cape Cod like the Falmouth Library used book sale. Wait, a book sale? Nancy English, president of Friends of Falmouth Libary, and Lenny Miele, former president. 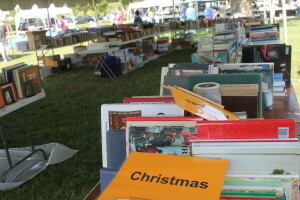 For one week, from July 1 to July 7, the Friends offer 50,000 used books for sale under several tents on the library lawn. 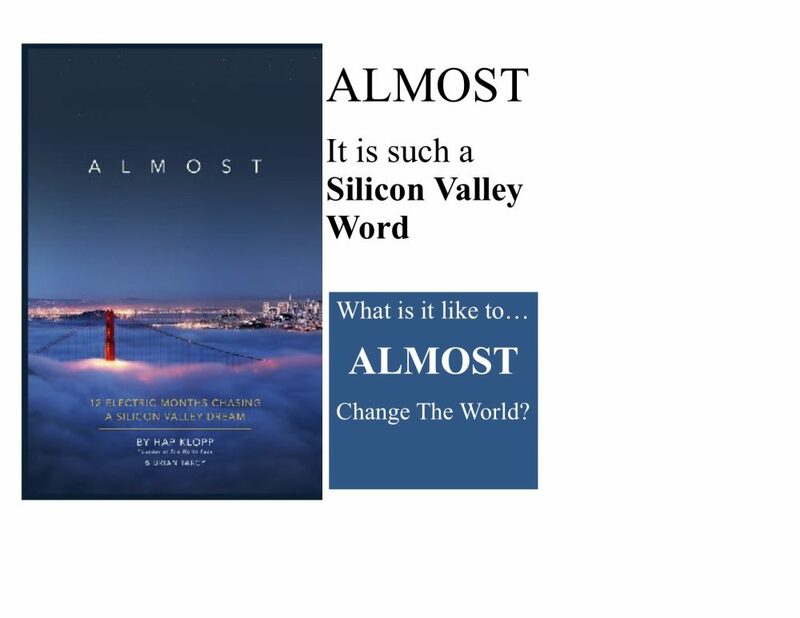 Books, donated throughout the year, are sold, for the most part, for either $1 or $2. Some specialty books or collector’s items cost more. “We provide and support programs for the library that the town cannot provide,” said Miele. Library Director Leslie Morrissey said, “Without the Friends, we couldn’t provide half the services we provide. They work really hard for the library.” And, she pointed out, they do they donate so much time during the week of Fourth of July. Miele pointed out that the Friends hold a second, smaller book sale in the winter, and that the Friends also raise money with an honor system used book sale in the basement of the library. “This raises $1,000 a month,” he said. The Falmouth Library used book sale is like Christmas in July. The books are donated year round in a depository in the library basement, and volunteers come in twice a week to sort books into categories and then box them for the book sale. “We had 1,700 boxes of books this year, and more than 50,000 books,” said Miele. According to English, the most popular books are children’s books, quality paperbacks, and mysteries. And in this modern world where almost everyone spends much of their day staring at a tiny electronic screen for reading material, there is something about a book. “People love picking up a book. They love the intimacy of it. They can curl up in bed with it,” said English. The sale runs July 1 to July 7, from 10 AM to 4 PM each day except the final day, when the sale ends at 2 PM. On the second last day of the sale, books are priced at half price. On the final day of the sale, books are “a buck a bag,” said Miele.